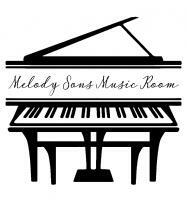 At Melody Sons Music Room, your child will receive a warm and fun environment to learn music. Students must be a minimum of 4 years old with basic reading skills. Four-30 minute or four-45 minute lessons per month. Summer lessons may also be arranged on a fee-per-lesson basis. Parents are welcome to sit-in with their child for a 30-minute trial lesson at the cost of $25. This is a great opportunity to meet the teacher and determine if her teaching style and personality make a good match for the student. After the initial lesson, parents may sit-in with their child during every 4th lesson of the month. In order for the teacher to provide her full, undivided attention, and for the student to have a learning environment free of distractions, siblings are asked to attend their lessons one at a time. For your convenience, parents and siblings may sit in the waiting area during lesson time. Due to the back-to-back lesson schedule, parents are advised to arrive and return at the scheduled time. As such, students are expected to arrive on time with all materials and their assignment notebook neatly placed in a tote bag. The teacher is happy to update and communicate with parents regarding student progress. It is requested that parents take the opportunity to touch base with the teacher during the last 5 minutes of the scheduled lesson time. As the saying goes, “practice makes perfect.” For fast progress, students are encouraged to practice daily for a minimum of 15-30 minutes. For this purpose, a timer is an excellent device to keep placed on your piano. Most students find it helpful to practice at the same time every day. Students will use an assignment notebook or practice chart for recording practice times; this provides a system of accountability to help the student stay committed to making progress. While the teacher desires to help the student develop and maintain progress, the parent can also help enormously by taking a participative role. Payments are to be made every first week of the month unless other arrangements are made with the teacher. Please note that additional charges apply for longer months where five lessons can be scheduled. If a payment is not received by the second week of the month, a $10 late fee will apply. HOLIDAY/CLOSINGS: There are NO lessons during Thanksgiving week, the 3rd and 4th week of December, and Independence Day (July 4th). Recitals are a great opportunity for students to showcase the musical skills they have developed with their family and friends. Recitals are held twice a year; student participation is not required but very much encouraged. A recital fee may be applied for a printed program and/or if the venue is not sponsored. Good communication between teachers, parents, and students are essential to ensuring musical growth. Suggestions are welcome and appreciated! Please provide comments/suggestions to the teacher by email or give her a call. Unexpected circumstances or schedule conflicts such as illness, a school trip, or death in the family, may result in the need to cancel a lesson. Whenever there is a genuine reason for a lesson cancellation, it is requested that the teacher be given 24-hour notice. A lesson canceled by the teacher will always be replaced. A lesson cancelled due to the inclement weather will always be replaced. For a lesson missed by the student, the teacher should be informed as soon as possible for other arrangements to be discussed. The teacher will try to be accommodative but cannot guarantee a replacement lesson due to the back-to-back lesson schedule. Please be aware that the teacher reserves her time for a scheduled lesson regardless of whether the student comes or not. Refunds or replacement lessons are not available for missed lessons or last minute cancellations. Monthly package lessons can only be terminated at the end of the month, please provide a two-week notice for termination of lessons. Parents are requested to provide a careful consideration to inform the teacher if they only intend to enroll for one month or a certain period of months. Photos and videos taken during lessons and recitals can be found at Melody Sons Music Room Website, YouTube Channel, and Facebook page. For privacy purposes, the name of the students will not be shown unless otherwise permitted by the guardian. Thank you for your kind understanding and cooperation with the guidelines and procedures! Please feel free to call or email the teacher with your questions, comments, and suggestions. Looking forward to our musical adventure together!